Three bodies of the 16 missing fishermen were salvaged Wednesday night by Suriname’s Coast Guard and members of that neighbouring country’s maritime police. Director of the National Coordination Center for Disaster Management told media in Suriname that the bodies showed signs of crime. Jerry Slijngaard, according to a report in the Surinamese newspaper, De Ware Tijd. The bodies were located in the Wia Wia Bank area after authorities waited for high tide to reach the location. 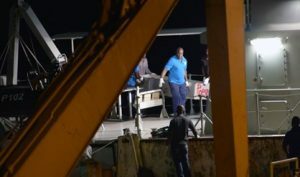 Meanwhile, it is believed that the body which was discovered on Wednesday by an airline pilot might be that of Danesh Persaud, a Suriname official said. The body was seen at Wia Wia Bank some 30 miles from where the unusual event occurred. Earlier Wednesday evening, fishermen and a few family members gathered at the mooring dock at the Anton Dragtenweg where one of unmanned boats had been towed to. In the boat the fishermen lit incense in honor of their colleagues. The bodies have now been held by the authorities as investigations continue into the almost one-week old incident. Four fishermen managed to survive the ordeal. Surinamese authorities believed that the perpetrators was Guyanese, based on accounts by the four survivors that their accidents sounded like persons from Guyana. It has been five days since some 20 fishermen, which include both Guyanese and Surinamese nationality were brutally terrorised and attacked, out at sea on the Suriname Coast, while plying their trade last Friday evening (April 27, 2018) . Danesh Persaud called Vicky, 28, a father of two, was one of the men, reported to be among those who endured the pirate attack. 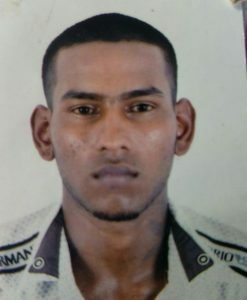 Persaud’s sister, Yurajwatie Hussain, who spoke with Demerara Waves Online News on Wednesday explained that what her family is going through at the moment cannot be described. She told reporters that her brother, who had gone to work since January, would frequently keep in contact with his family. Hussain said that the last person who spoke to her brother was his wife and was told that he was about to cook ‘cat fish curry’ for work. “His wife asked him if it’s so late you cooking, he said yes and when they found the boat it was the same catfish curry.” Hussain further explained that after receiving the unpleasant news on Saturday family member have since travelled to Suriname for information and to seek answers to their questions. Persaud was scheduled to return home to celebrate his birthday with his family on May 27. Doris Harihar, 75, the grandmother of another missing fisherman, 20 year old Rolph ‘Burnhum/Winky’ Coutchman, cried uncontrollably as she related to this Online Publication that her only source of income is her monthly pension and she depends solely on her grandson (Coutchman) for assistance. 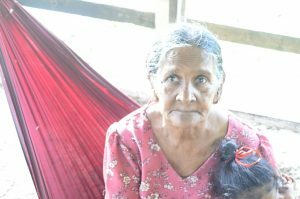 The elderly woman expressed her dissatisfaction about how the situation is being dealt with by the relevant authorities, sighting that to her little is being done by Guyana Government but the Government of Suriname she said, is working “nonstop to discover the bodies and details”. The father, uncle and cousins of Danesh ‘Vicky’ Persaud, while a cousin of Ralph Coutchman has since travelled to Suriname. The relatives, several of whom travelled one or two days after the incident are hoping to return with the positive. Demerara Wave Online News understands that four persons reportedly survived the tragedy. Three of the four are said to be receiving medical attention at a hospital in neighbouring Suriname. They were pulled out of the water by other fishing vessels and two fishermen were found in a boat. A captain reported that warning shots were fired at his boat; he reported that the men then entered his boat and assaulted his crew. He said that he was thrown overboard but he managed to swim away. On Friday last a group of 20 fishermen were assaulted. They were beaten and robbed by pirates while out on the Suriname Coast. They were severely chopped and tossed overboard.